Cook the rice in boiling water for 15mins until just tender. Drain and rinse in a sieve until cold. Empty into a bowl; add the lentils, apricots, pumpkin seeds. Drain the peppers reserving 3 tbsp of the juices, mix this with the oil, garlic, vinegar and seasoning to taste. 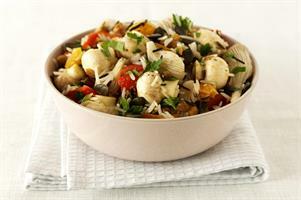 Slice the peppers into strips and stir into the rice with the mushrooms, parsley and dressing. Leave to marinate in the fridge for at least 30mins before serving.